In terms of actual daily movements and combined totals for the whole of the Spring period, 2005 represented another poor year. Although coverage was down on many other years, conditions on certain days visited were ideal for visible migration, but yet counts were still low. The Spring did offer a range of exciting uncommon migrants though, with the area's best ever selection of raptors. There was a period of concentrated Common Buzzard passage through the area between April 10-15th. A minimum of 13 birds were involved, most of which were seen moving high north or north-east. Individuals/sightings are listed below. Other Common Buzzards were also noted moving at other sites (including some in Notts) on April 11th. What was more or less the same period also produced two Red Kite present in trees at Red Hill, before they flew off north on April 7th. Ospreys were noted moving north-west near Eakring village April 9th and north over Eakring Flash two days later on April 11th. Three records of Merlin represented an excellent late Winter/early Spring total, with a female moving west February 8th, a male at Eakring Flash briefly, before flying off west February 22nd and another male low west over Red Hill on March 14th. Two Hobby were noted actively migrating on April 29th and May 13th. The real highlight of the Spring was the male Montagu's Harrier that headed south over Eakring Flash and eventually drifted off high south-west during the late afternoon of May 3rd. A Short-eared Owl was around Eakring Flash on the late evening of April 10th. Although most warblers arrived on time and producing average first arrival dates, the number of males in territory by each species' main arrival dates were initially well down on previous years. It took several more weeks before numbers reached normal levels and some species even went on to exceed the breeding populations of previous years. The first returning Chiffchaff was at High Trees on March 19th. This was followed by a more general Chiffchaff arrival from March 24th onwards. Daily arrivals were rather flat in comparison to the typical distinct arrival peak of late April shown in previous years. This could have been down to unsettled weather across France and Spain at the time, halting the northerly movements of many migrant species. A highlight of the Spring was the occurrence of the area's second ever Spring Reed Warbler - a male taking up territory at Eakring Flash from May 15-28th. More birds followed and there were two singing males from May 29th onwards and both eventually remaining till at least July 21st. The first female arrived on May 31st and in the middle of June, a third male was present for one day only on June 19th. A fairly decent Spring passage through the area. March produced single Curlews on 24th and 26th, but it was'nt until April that the number of wader records increased. Two Little Ringed Plover went north-west on 25th, a Common Sandpiper was present all day at Eakring Flash (26th) after having obviously arrived at some point during the night. It represented the sixth record for the area and the first ever in Spring. Whimbrel sightings included two north-west over Eakring Flash (April 25th) followed by other singles on April 27th, May 1st, 2nd and 12th. A Redshank at Eakring Flash on May 1st, was typically brief before flying off south-east. A male Quail at Eakring Flash (May 12th) called intermittantly around mid-morning. The bird was in cereal fields just north of Eakring Flash and situated close to the public footpath that runs directly north between Eakring Flash and Lound Wood. This was the first record since a brief calling male near Lound Wood in June 2002 and it's arrival again coincided with an area of high pressure and easterly-biased winds. Not surprisingly, another was located next morning at the southern-end of Eakring Flash and remained until 14th. By May 15th, just one bird was calling and called well during the evening for the first time during it's stay. It was quite surprising when there was no subsequent sign over the following evenings. A rare Spring Redstart record concerned a male in the Hawthorns at Penny Pasture Common on April 11th, whilst newly arrived Wheatears were at Park Farm from April 10-11th and at Tug Bridge Farm April 26th. 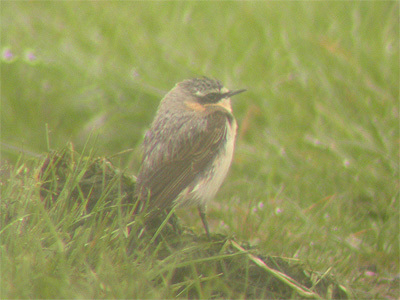 Heavy early morning rain on April 30th saw three Greenland Wheatears grounded at Eakring Flash. These coincided with large numbers of Wheatears, including many birds of the Greenland race at Spurn Point Yorkshire. It was another very poor Spring for Whinchat, which maintained the trend of recent years. May produced the only record of the Spring, when a female was at Penny Pasture Common on May 1st, whilst a late female Wheatear was around the manure heaps at Church Hill on May 11th. Summer migrants to arrive were Cuckoo moving east on April 28th (latest ever arrival date) and another north-east on 30th. Unusually, no males held territory during April for the first time ever. Last year, I voiced my concerns over the lack of Cuckoos, both in the Eakring area and at many other sites I visited and this trend seems to be continuing. Other Summer migrants were also in unusually short supply for the closing days of April. A Swallow moving east over Eakring Meadows on March 27th, finally broke the long-standing earliest record which had remained intact since 1998, whilst White Wagtail, Grasshopper Warbler and Reed Warbler all produced new latest dates. Visible migration counts of finches and thrushes saw very meagre totals. Five Brambling east over Eakring Flash on March 24th was (however) extremely noteworthy, but Fieldfare produced a poor series of daily counts of which 142 west and north-west on March 20th and 194 north-west and east on March 24th were best. Accumulated migration totals for for the whole of April produced just 279 Meadow Pipit, 123 Swallow, 20 Yellow Wagtail, 61 Goldfinch and 144 Linnet.